I think Seoul, the capital of South Korea, is one of the most exciting cities in the world. It is a glorious mixture of cutting edge technology and ancient traditions. This wonderful contrast is illustrated by the sight of young people wearing the traditional hanbok as they stroll past the modern buildings that populate the city. It is only a hundred years since South Koreans stopped wearing the hanbok on a daily basis but it is still worn on special occasions. My top eleven experiences are also a mixture of ancient and modern. Changdeokgung Palace was one of five great palaces built by the Joseon Dynasty or Chosŏn dynasty . It is the best preserved of the remaining royal Joseon palaces but it is not the original building which was burned down by the inhabitants of the town. They were angry because the royal family had gone into hiding when the Japanese invaded Korea at the end of the sixteenth century. 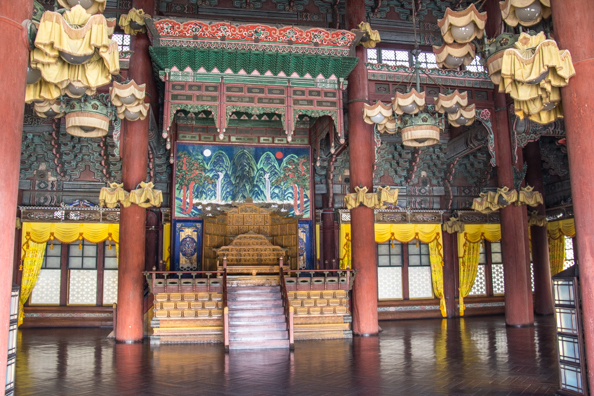 The palace was restored in 1611 when the reigning king, Gwanghaegun, returned to the city. One unusual tradition relating to this palace decreed that only the king could die there. To this day this tradition is upheld and relates to animals as well as people. The Palace is a UNESCO World Heritage Site as it is home to a number of cultural treasures including the ornate Injeongjeon Hall. 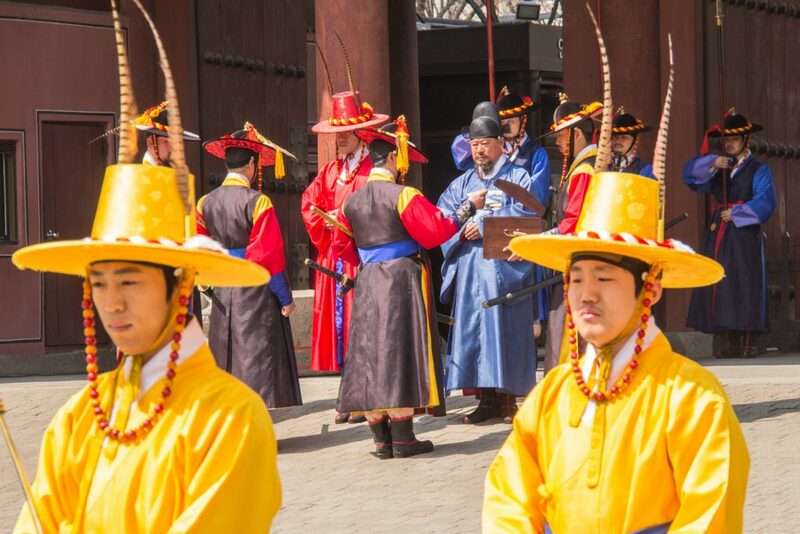 The changing of the guards’ ceremony at Deoksu Palace replicates a tradition that had died out but was re-introduced twenty years ago. 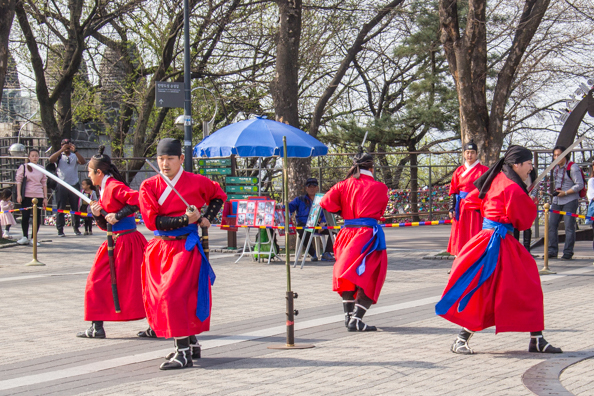 It takes place in front of the Daehanmun Gate and lasts for thirty minutes. The Guard marches, traditional instruments are played, passwords are exchanged and the new guard replaces the old guard. 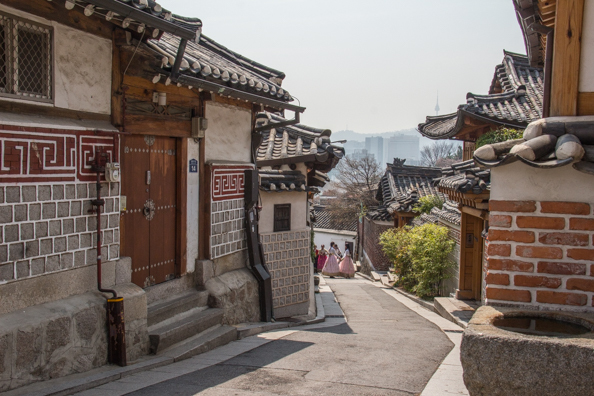 Bukchon Hanok Village is a suburb of Seoul and is comprised several streets lined with traditional one-storey houses. Perched on a hill above the city this pretty village has been here for almost six hundred years. It has undergone very little change over the centuries as the residents have been careful to restore their properties using traditional methods and materials. It used to house the aristocracy and the wealthy but today it is the home of restaurants, tea houses and cultural centres. Visitors to this area can also enjoy views of some of the historic buildings of Seoul below them. Insadong Antique Alley is located in the heart of the city. 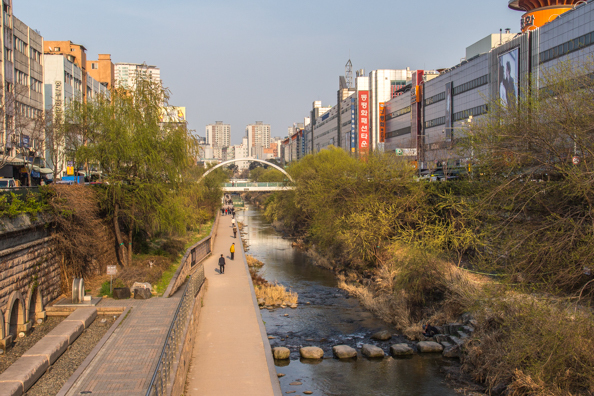 This pedestrianised street has always been a centre of Korean traditional culture and crafts. For centuries it was a centre for artists. Today it features a unique place for folk crafts. 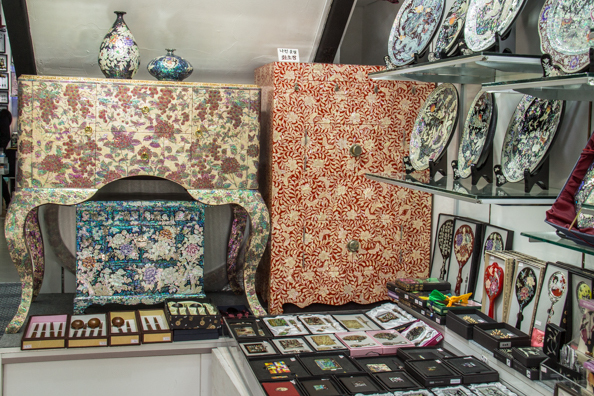 Products available include traditional paper, traditional teas, pottery, calligraphy materials, antique furniture and folk crafts. A great place for souvenir shopping. South Korea has some very distinctive cuisine and one of the most popular dishes is Bibimbap, The word means mixed rice and the dish is a bowl of warm white rice with a variety of toppings piled on top. These toppings include namul (sautéed and seasoned vegetables) and gochujang (chili pepper paste), soy sauce, or doenjang (a fermented soybean paste). A raw or fried egg and some sliced meat (usually beef) are common additions. The egg cooks when the components are mixed together. It is usual accompanied by a selection of side dishes including the very popular fermented cabbage known as kimchi. Street food is a strong tradition in South Korea. 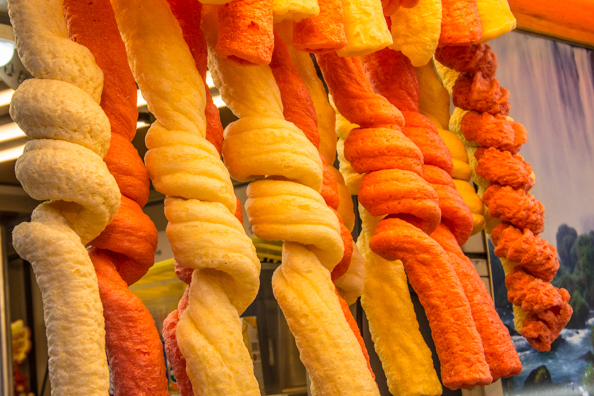 Many of the stalls selling a variety of batter coated fish and meats are. The latter is a strong tradition in South Korea and many of the stalls are surrounded by benches or stools so people could sit and eat at them. I was fascinated by the colourful Street food especially the Jipangyi icecream – ice-cream inside a cane made from maize. The ice-cream in South Korea comes in every shape and colour imaginable. Gwangjang market, is the country’s most important market. Korean couples planning their wedding and setting up their new home can purchase everything they need under one roof at good prices. Their purchases will include the yedan (wedding presents given by the bride to the groom’s family). Marriage in South Korea a marriage represents the joining of two families and not just the joining of two people. Many traditions and customs are observed at a South Korean wedding. 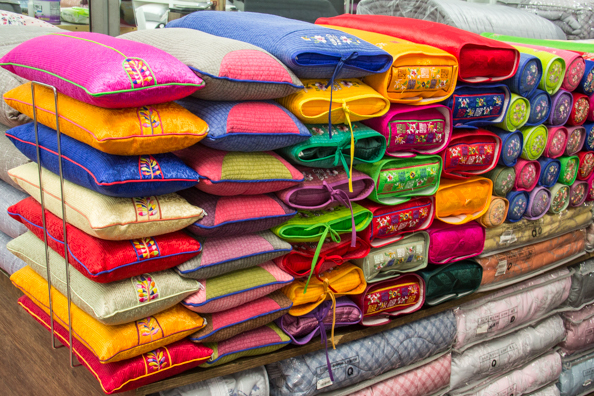 This market features vibrant displays of colourful bedding. I had been surprised to learn that many Koreans still sleep on the floor and some hotels have special rooms to accommodate this custom. From the top of the Namson Seoul Tower visitors can enjoy panoramic views of the city of Seoul. The tower is in the Namson Park is the largest park in Seoul. It is renowned for its walking trails that thread their way past many species of trees and plants. During cherry blossom time its Cherry Blossom Path is the longest avenue of cherry trees in the city. The area at the bottom of the tower is used for performances of traditional Korean Martial Arts and Music. For more conventional shopping browse the shops in the Dongdaemun Shopping Area. This area is famous for its non-stop shopping as the shops are open from ten in the morning to five the next morning. The multi-storey shops include wholesale warehouses where every kind of product can be purchased. Racks of clothes spill out onto the street and street food stalls refresh enthusiastic shoppers. The Dongdaemun Design Plaza known as the DDP is the newest and most iconic landmark of the design industry in Korea. It serves as a venue for design-related shows, conferences and exhibitions. The complex was designed by Zaha Hadid, the world renowned architects. 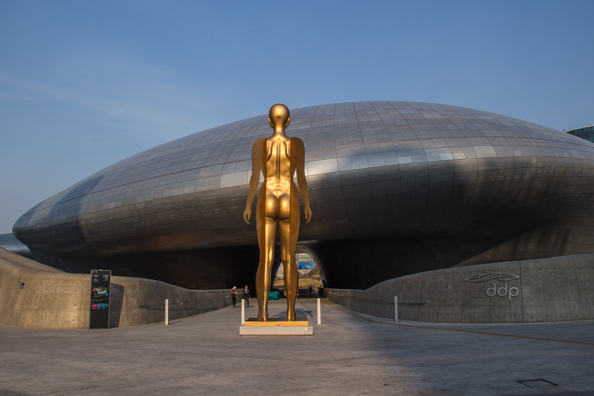 It has five halls, the Art Hall, a Museum, a Design Lab, the Design Market, and the Dongdaemun History and Culture Park. I spent an hour in the Design Shop and managed to resist the opportunity to have a model made of myself. It was tempting though and something I have never seen before. The gates and walls that once surrounded the city have now been incorporated into the city itself. The Heunginjinmun Gate http://www.exploringkorea.com/heunginjimun-gate/ has been parted from its walls by a road throught the city centre. Built in 1390 this gate was the East Gate of Seoul when it was the capital of the Joseon Dynasty. Its pavilion once housed the commander who guarded the gate, now it is a roundabout. Across the road part of the city walls have been preserved in a park, Dongdaemun City Wall Park. Inside this park is the Seoul City Wall Museum visitors can learn the history of the walls . 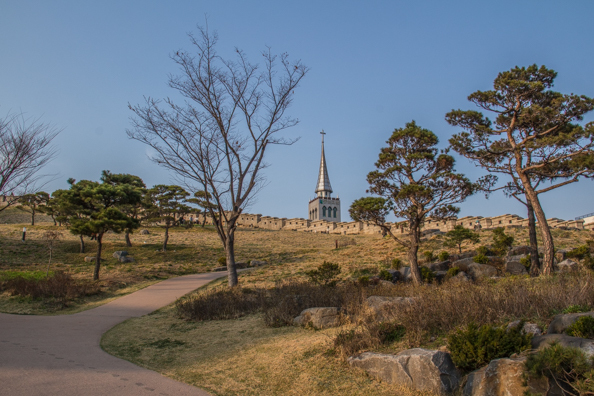 This park is also the start of the Excursion Trail of Hanyangdoseong. 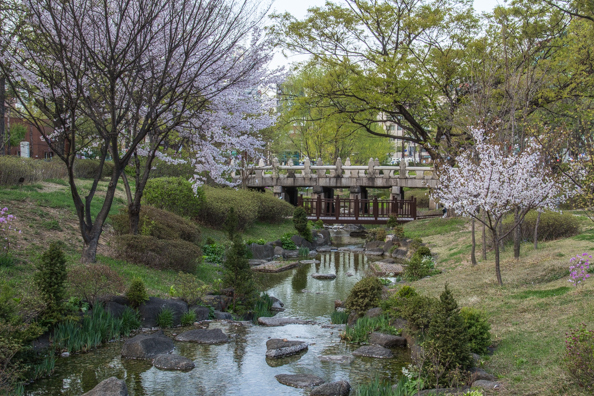 The lovely Jangchungdan Park offers a peaceful retreat from the urban landscape surrounding it. The Cheonggyecheon stream runs through this memorial park. Just inside the park the stream is crossed by Supyogyo Bridge or the Water Gauge Bridge. This bridge was built here in 1420 to measure the water level in the stream. This park is located at the foot of the Namsan Mountain and was originally the site of the Jangchungdan shrine. This shrine was destroyed during the Korean War. When the park was established in 1919 the Jangchungdan Monument was placed there to commemorate this war. There are other memorials and a tea house in the park. Pretty wooden bridges criss-cross the stream and there is a waterfall at the far end.